Two young Glasgow citizens are petitioning to stop the proposed removal of the steps to Glasgow’s Royal Concert Hall, as part of the council’s £390 million plan to regenerate the city’s Buchanan Quarter. Stephen Eve, a former History and English student at Strathclyde, and Ben Bookless, who is studying Counselling Skills at the University’s Centre for Lifelong Learning, are calling on people to sign their ‘Save the Steps’ petition which aims to raise awareness of the cultural importance of the steps, and stop the plan to replace them with a glass atrium. Eve, 24, said: “The steps have become part of everyday life for many Glaswegians, who meet friends there or sit with their lunch and take in the views over Buchanan Street. 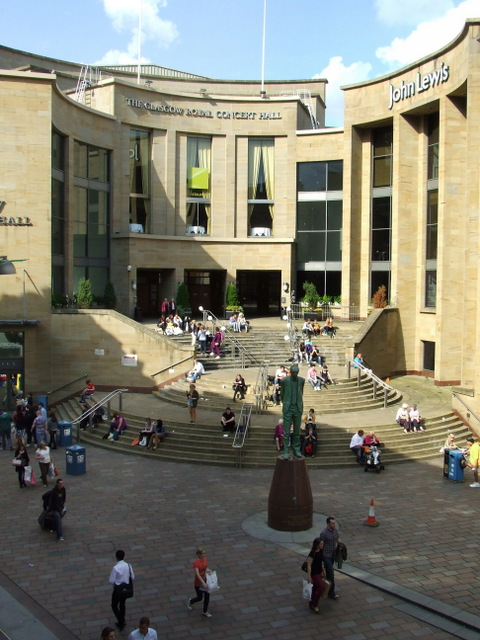 The steps, which are situated on the top of Buchanan Street behind the Donald Dewar statue, have been part of the Concert Hall that opened in 1990. Over the years they have become a popular meeting point, place for workers to eat their lunch and provides an outlook over Glasgow’s most famous street and as far as Eaglesham’s wind farm. Bookless, 25, said that the steps have become an “iconic place” for rallies and protests, adding that the steps were used by both sides in the recent independence referendum. The Scottish Government has backed the plans by Glasgow City Council to raise the funds for this scheme through Tax Incremental Financing. This permits cash to be borrowed against projected rises in business rates. George Square and Upper Dundas Street have been redeveloped prior to the Commonwealth Games, but work on the Concert Hall and Buchanan Street has yet to start. The project will convert the existing car park in the Buchanan Galleries to a retail space with a new car park added. However, many people are not in favour of these plans- including a number of prominent Scottish politicians. Green MSP Patrick Harvie, told the Daily Record: “A city centre is not just for shopping – people need somewhere they can gather, even if that’s just to eat their lunch on a rare sunny day. SNP councillor Billy McAllister referred to the steps use during the referendum vote. Bookless and Eve are encouraging those who oppose the removal of the steps to sign their ‘Save the Steps’ petition at https://you.38degrees.org.uk/petitions/save-the-steps. Details of a public protest at the steps will be announced later this year. Posted in News and tagged Glasgow, petition, royal concert hall. Bookmark the permalink.